A list of lists of One Piece chapters. One Piece is one of the longest currently running manga in the world. There are several lists to list all the chapters. Plot: Three years before the beginning of the One Piece series, the Shiki and the Roger Pirates have made contact in the New World. Vice-Admiral Monkey D. Garp, receiving the news, heads off with Fleet-Admiral Sengoku to meet them. While in the New World the Roger Pirates prepare to clash with Shiki and his Golden Lion Pirates. Shiki asks Roger to join him and give Shiki his knowledge of an ancient weapon, but Roger refuses and eventually they the two crews clash. Years later, after Roger becomes the King of Pirates, Shiki discovers that Rogers is about to be excecuted. Hearing this, he heads to Marineford where he believes Rogers would be held, but is defeated by Garp and Sengoku, and sent to the underwater prison Impel Down. Shiki later manages to escape and begins plotting his revenge on the island of Merveille in the Grand Line. At the same time, many of the events that take place in the current One Piece story are beginning, such as the beginning of the Red Hair Pirates and the dawn of the Great Age of Pirates. Anime: The chapter was animated into an episode of the One Piece anime by Toei in 2012, named One Piece Film Strong World: Episode 0. Note: Was released with One Piece chapter 565 and was created to be a tie-in to the film Strong World. Plot: The story concerns a samurai named Ryuma traveling to a small town where he meets a young woman named Flare whom he befriends after she saves his life by giving him food. While there he also encounters another swordsman by the name of Cyrano whom he ends up challenges for a battle, but is stopped by the Flare who explains to him that the Cyrano is the local towns hero because he saved her form a dragon that destroyed her mountain village years ago, she also tells Ryuma that he is the second greatest swordsmaster in the world, behind only the one known as "The King". Ryuma refrains from fighting Cyrano and instead goes for a walk. While on the walk he accidentally bumps into a man whom screams and accuses him of stabbing him. The man blows a horn which he claims will summons the dragon and then seemingly dies. The dragon attacks the city and Flare and Ryuma discover that Cyrano and the man from before are busy looting the town for riches instead of fighting the dragon. It is revealed that Cyrano and the man were behind the dragon attack years ago as well and Ryuma decides to fight them and kill the dragon. He defeats both quickly and then leaves the town. In the end it is revealed that Ryuma is the one known as "The King". Plot: Monkey D. Luffy, a young pirate arrive in a village where he encounters a young swordswoman named Silk, together they have to defeat a pirate named Crescent-Moon Galley. Luffy's backstory is also shown within a flashback. Anime: Chapter was adapted into an OVA to commemorate the 40th anniversary of Shonen Jump in November 24, 2008. Note This work was the first ever appearance of the characters of MOnkey D. Luffy and Red Haired Shanks. Plot: Monkey D. "Strawhat" Luffy, a young pirate travels on the sea in a small skiff. He encounters a girl named Ann who has a giant bird whom a sorcerer pirate named Spiel the Hexagon is trying to steal from her. Together they have to defeat him to save Ann's bird. Luffy's backstory is shown in a flashback, it is shown that Luffy was given his strawhat by his pirate grandfather. Note This publication is the first appearance of Luffy's grandfather, the character was changed substantially from the early version to the main series, in the main series he is a Marine as opposed to a pirate. Plot: The story examines what would have happened if Luffy's brother Sabo has appeared at the end of the summit war and saved the life of their brother Ace. Plot: The character of Shenron, who has just granted Mr. Satan's wish by a Dragon Balls to become a king, has invited his friends for a party. Various characters from Dragon Ball and One Piece all respectively try to make their way to the party. Plot: Luffy, on an island named Gourmet Island provides, meets Toriko who has discovered what seems to be a Devil Fruit. Toriko explains that he wants to know what a Devil Fruit tastes like, Luffy tells him that a Devil Fruit tastes very bad. Despite this and their associated curse, Toriko nonetheless wishes to eat it. He eventually does after his friend cooks it. Toriko and Luffy have a party where he eats it, but he finds out that it was not actually a Devil Fruit. Note: This crossover was published together with One Piece chapter 619. ^ Fan: Question for you!! Is the swordsman "Ryuma" who was once said to have defeated a dragon the very same Ryuma that starred in the short story "Monsters" from your collection volume entitled "Wanted!"? He is, isn't he? I'm so desperate to know, I can't brush my teeth. If I get a cavity, I'll tell the dentist it was your fault. Oda: Well, here are two questions about my old short story collection, "Wanted!" I'll tackle Ryuma's first. The zombie Ryuma appears in Chapter 450 from this volume, and he is indeed the Ryuma who starred in "Monsters". ^ Oda, Eiichiro. "One Piece zero vol.0 Strong World limited comic manga" – via Amazon. ^ a b "One Piece Strong World". 23 July 2010. ^ a b c d "One Piece Box Set 3 Will Contain Dragon Ball & Toriko Crossovers". 4 April 2016. 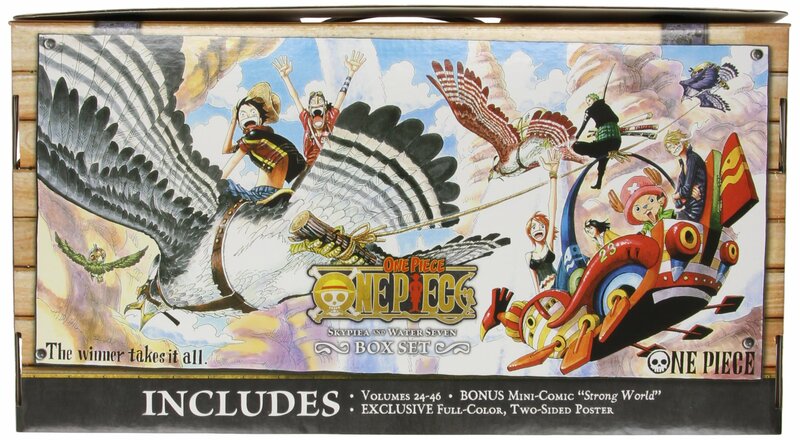 ^ "One Piece: Strong World - Anivision". anivision.org. ^ "The Early Years: MONSTERS". www.theotaku.com. ^ "The Early Years: ROMANCE DAWN - The One Piece Field Guide". www.theotaku.com. ^ a b "VIZ Media di Twitter: "The best part of the Romance Dawn mini-comic in the One Piece Box Set is being able to see 21 year old Oda's art."". 23 September 2017. ^ "One Piece Creator To Reveal What Would've Happened If Ace Lived". ^ Official Shonen Jump Podcast: Episode 150; Interview with Alexis Kirsch, the editor of One Piece for the English language Weekly Shonen Jump magazine. - VIZmedia - 4 April 2016 – Youtube video unavailable in some territories. This page was last edited on 24 January 2019, at 23:53 (UTC).